Here's a piece of happy news: Beside Still Waters, the volume for mourners that I edited for Bayit which we published in partnership with Ben Yehuda Press, is the #1 new release in Jewish life on Amazon! I'm endlessly grateful to everyone who contributed poems and prayers and readings. The book is reaching people because of the breadth and richness of the work assembled therein, and I am humbled and honored to have been able to midwife it into being. You can find the Table of Contents, the introduction, and assorted other excerpts via the Look Inside This Book feature on Amazon, and those same excerpts are mirrored on the book's page at Bayit and on the book's page at Ben Yehuda, where discounts are available for bulk orders of ten or more copies. Beside Still Waters: A Journey of Comfort and Renewal is a book for mourners, for those who will someday become mourners, and for those anticipating their own journey out of this life. It offers liturgy both classical and contemporary for different stages along the mourner’s path, from prayers for healing (even when “cure” may be out of reach) and prayers to recite before dying, to prayers for every stage of mourning: from aninut (the time between death and burial), to shiva (the first week of mourning), to shloshim (the first month), the culmination of the first year, yahrzeit (death-anniversary) and yizkor (times of remembrance). Those who are interested can find the Table of Contents, the introduction, and assorted other excerpts via the Look Inside This Book feature on Amazon. I hope you'll take a look, and consider buying a copy (or several). Order Beside Still Waters at Ben Yehuda Press now. The book retails for $18.00. ...Like fire, justice is a flame that heats and illuminates, but without proper insulation fire can do harm. Like water, love wants to flow where it’s needed, but without proper channels flow can become a flood. Fire and water need to be tempered, balanced, channeled. That’s the first building lesson I find here. In God’s image, we must ensure that as we build we balance judgment and love, fixity and flexibility, container and flow. That's from my latest post for Bayit's Builders Blog, with sketchnotes by Steve Silbert. Read the whole thing here: Build for Loving Balance: Fire and Water, Justice and Repair. Over winter break, my son and I built this gingerbread house. Read the whole thing at Builders Blog: Building A Gingerbread Bayit. ...We can build a Judaism that truly uplifts all of our various diversities as reflections of the Infinite in Whose image we are made. We can build a Judaism that balances backward-compatibility with innovation, not for innovation’s own sake but for the sake of a Jewish future that’s open to the holy’s renewing flow. And we can build a Judaism that’s profoundly ethical not only in word but in deed, a Judaism that centers the obligation to protect the vulnerable from abuse. That's from this week's Torah post at Builders Blog, co-written by me and my Bayit co-founder Shoshanna Schechter, and sketchnoted by Steve Silbert. Read the whole thing here: Calling Us To Becoming. This week we're reading parashat Bereshit -- the first portion in the Torah -- and we're launching a new series on Builders Blog. Each week a different person will share thoughts on the weekly Torah portion, drawing out themes of building. Our first installment comes from Rabbi David Markus, and it's a gorgeous post about seven principles for builders (enriched by sketchnotes from builder Steve Silbert!) Read it here: First Build: Seven Foundation Principles for Spiritual Builders. Bayit's summer learning week together begins with Shabbes. We come together from all of our various home places, put on our Shabbes whites, and daven, walking outside with a guitar to welcome the Shabbat bride into our midst. When we gather around the dining table, our kiddush soars, and my soul with it. We feast and talk and laugh and sing the birkat hamazon (grace after meals). We walk to the beach under the just-past-full moon and swoon at the sparkling path of moonlight across the waves. On Shabbes morning our davenen is long and leisurely. Leadership flows organically: someone picks up the guitar or begins to offer a melody and the rest follow. Rabbi Mike Moskowitz gives over some Torah, and we talk about Balaam, social justice, and when it is and isn't someone's job to educate those who mistreat them. Later we study when one can send a shaliach (messenger) on one's behalf and when it's important to do a mitzvah with one's own hands, and social justice, individual, and community. There's beach time, text study, singing. There's the indescribable sweetness of spending a full Shabbat with others who care as much as I do. There are long afternoon conversations, and singing around the table as daylight wanes. There's havdalah outside, our hands cupped around the candle so the ocean breeze doesn't blow it out. There's late-night conversation about what it means for our building work to be a tikkun for what has been broken, and even later-night Pictionary with endless laughter. And that's just the first night and day. We daven every day, gliding in and out of service leadership, singing in harmony. 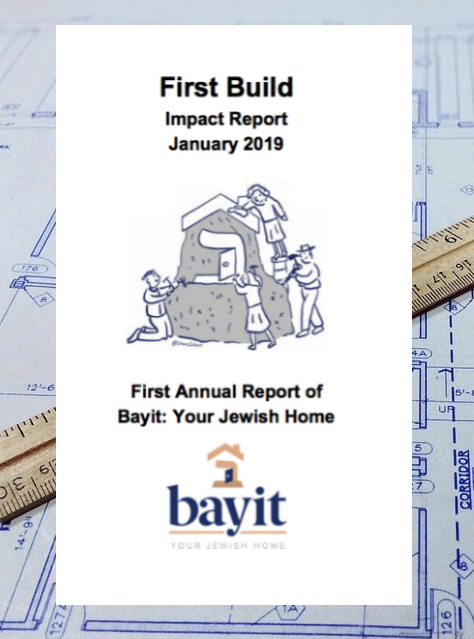 We dedicate hours to talking about Bayit's mission and vision, about the projects that are already underway, about partnership and collaboration, about what we yearn to build. We cook meals and clean up from meals and walk across the street to the beach and lounge by the ocean and swim and bask in the sunshine. We dive deep into the nature of innovation, systems and structures, how to wisely do spiritual R&D. We study mussar, Shabbat, and medical halakha and ethics with Rabbi Jeff Fox, the rosh yeshiva of Yeshivat Maharat. There's a text from the Nezer Yisrael -- about Shabbat, oscillation between giving and receiving, and how divinity can be manifest in authentic relationship -- that lights me up like a Chanukiyah. There are teshuvot (responsa) and texts that raise big questions about identity, disability, change, personhood, and the halakhic process. We talk and grapple and question and learn. We spin blue-sky dreams about where we want the Jewish future to go and what we want to build, about curation and collaboration and innovation -- and then we anchor those dreams in six-month and one-year and three-year and five-year plans. We talk about empowering folks to build an accessible, meaningful Judaism now. We talk about governance and publishing and the internet and spiritual seekers and "all ages and stages." Then we set our work aside and immerse in the ocean, with joy. We begin to brainstorm about how we might re-invent the second day of Rosh Hashanah. What is the spiritual journey of that day, and how is it different from the first day? What do our communities need on that day? What elements ask a new uplift? What is the valance of teshuvah (returning / "repentance") on that day distinct from the day before? What kind of temporal and spiritual runway do we need so our communities can accompany us into the spiritual territory we want to explore that day? One night we bring folding chairs to the beach and daven ma'ariv with a guitar, accompanied by the waves, beneath the spread of stars. No one has a siddur, but it doesn't matter; we have the words and the matbe'ah (the service's internal structure) by heart. We sing to the One Who placed the planets in their orbit and the stars in the heavens. Because it came up in conversation earlier that day that one of us loves "Hotel California," we close with "Adon Olam" to that melody in multipart harmony. When Bayit's summer learning and visioning week comes to an end, I'm sad to leave this space of learning and visioning and holy play... and grateful to have such hevre with whom to do the holy work of building together. Deep thanks to The Jewish Studio, our fiscal sponsor, for making this week possible -- and to my hevre, for dedicating their hands and hearts to the proposition that everyone can be a builder, and that a meaningful, accessible, renewing Judaism is ours to build together. With [some of] my Bayit hevre: building toward the Jewish future together.